1. Cut the parsnips and potatoes into small chunks and cook in boiling water for 10-15 minutes until tender then drain and roughly mash. Stir in the cabbage. Season with freshly ground black pepper before adding the Stilton and chives then stir to combine. 2. Shape the mixture into 8 patties, dip each one into seasoned flour, then egg, then breadcrumbs. Repeat with all the patties before popping in the fridge for at least 20 minutes. 3. 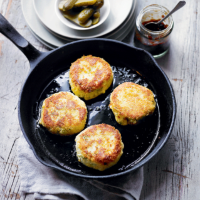 Heat the oil in a frying pan and gently fry the patties on each side until golden and crisp. Serve hot with cold meats and pickles.